They’re red, they’re tasty, and they’re one of Michigan’s most prized specialty crops! Fresh sweet Michigan cherries are in season from late June to August while Montmorency tart cherries are available throughout the year in dried, frozen, canned, or as juices and concentrates. Montmorency tart cherries are abundant in anthocyanins – a natural compound that contributes to the ruby-red color, distinctive sour-sweet taste, and has been linked to the potential health benefits of Montmorency tart cherries. A growing number of elite athletes and everyday exercisers are incorporating Montmorency tart cherries in their training routines, as studies have shown that Montmorency tart cherry juice may help reduce strength loss and aid recovery after extensive exercise. 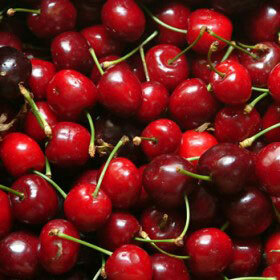 Research indicates that Montmorency tart cherry juice may help improve the quality and duration of sleep. To learn more about cherries, visit The Cherry Marketing Institute at www.choosecherries.com.